Shark populations are declining around the globe, with over 140 species of sharks swimming towards extinction. The demand for fins, for use in shark fin soup, is a major reason sharks are disappearing - over 73 million sharks are killed for their fins every year. FedEx does and will ship shark fins, as long as they are packaged properly and won't spoil. This is their policy for anything being shipped for 'human consumption'. The shark fin trade has been dealt a blow recently by Air China and UPS which both announced that they will no longer be shipping shark fins, a great win for sharks. 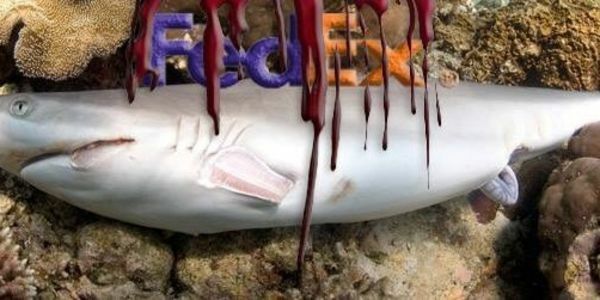 Make a difference and help save our oceans by speaking up and signing this petition to tell FedEx to stop shipping shark fins. Read more at World Animal News. Shark populations are declining around the globe, with over 140 species of sharks listed as endangered, threatened, or near threatened by extinction. One of the primary reasons sharks are disappearing is overfishing, driven by the demand for shark fin soup, an international delicacy. Please stop shipping shark fins, and join UPS in playing a leadership role in global shark conservation. FedEx has a choice to make. Are they going to join UPS and other shipping companies and stand up for sharks, or are they going to continue contributing to sharks’ extinction? FedEx has acknowledged our efforts and has pushed our request up to their senior leadership. Make a phone to Carmine Echols 901-369-3600 today to urge FedEx to help save sharks. Click for details. Thank you for signing the petition urging FedEx to stop shipping shark fins. We are thrilled to be working with the Oceanic Preservation Society, the team behind the film The Cove and the upcoming thriller RACING EXTINCTION. Here's a clip from the film, have a look and pass it on. You can learn more about RACING EXTINCTION here. Thanks for your support - Make sure to share the petition and help us hit 300K!